When we asked a local where we could go for good crepes, they told us about this place and said we wouldn’t be disappointed. How right they were. It was a little creperie hidden away on one of the side streets. The tables were close together but we didn’t mind that. There was something so inviting about this restaurant and it really made us feel that we had discovered a place that was loved by the locals. There only seemed to be two members of staff-one waiter and one chef. Both were very friendly with us and when we returned a couple of days later, they greeted us like they knew us well. The kitchen area was along one side which overlooked the tables. This meant that customers could chat to the chef while he was making the food. We were given a small green salad for a starter which was a nice touch. On our first visit, we had both savoury and sweet crepes. One of the savoury ones was egg, cheese and ham and the second one was mashed tomatoes and mushrooms. The tomatoes were so tasty and both crepes were thoroughly enjoyed. Our dessert was an apple, caramel and almond crepe. Just perfect to complete the meal. Our second visit included two of the chef’s specials, La Potagere and La Rustique. La Potagere was a vegetarian buckwheat pancake with mashed tomatoes, leeks, mushrooms and carrot puree. This was not the usual crepe but more like a dense bread pattie. It was different but all the same really delicious. La Rustique was a thin crepe with smoked bacon, egg, goat’s cheese and mashed tomatoes. There was just the right amount of all the toppings and you could tell that the goat’s cheese was of good quality. The thing that we liked about the crepes here was that they weren’t folded into triangles like you would get at the other creperies. This meant that you could actually taste the plain crepe. The toppings were put on separate areas of the crepe, so that it was up to you what combination you created. 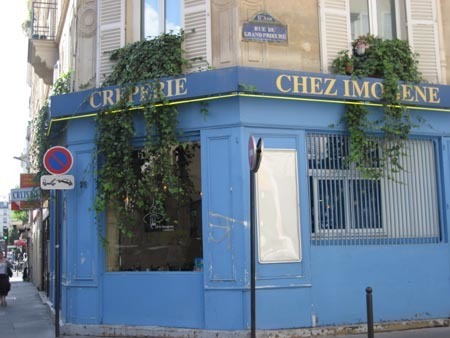 I would avoid all the other street stall crepe places and make a worthwhile visit to Chez Imogene. Just a note, this creperie is closed on Sundays.